Delonghi Des14 Review - Is It Still Worth Buying? The Delonghi DES14 sits right in the middle of the ever popular DES range of dehumidifiers by Delonghi. The only real differences between the DES12 and DES16e is that of power, with the 12, 14 and 16e rated at 180W, 230W and 250W respectively. The DES16e is also home to a digital control panel over the DES12 and DES14’s simple analogue dial. This model has been around for sometime as it was first released in 2007. But, can it compete with newer models and increased competition from brands like EcoAir and Ebac? In this review we’ll find out if the DES14 still offers good value for money. 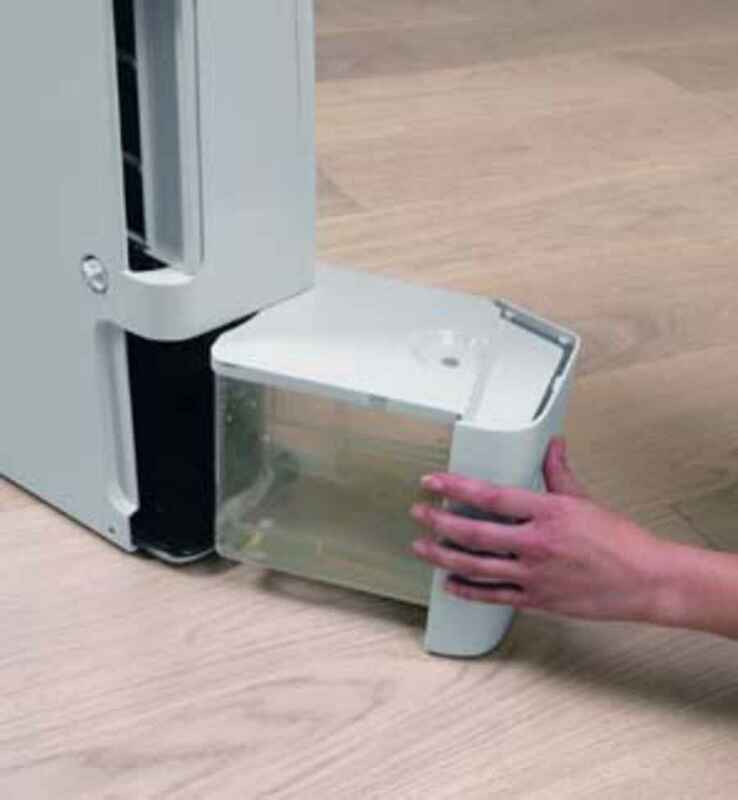 The DES14 has very compact dimensions of 37.5cm wide, by 19cm deep, by 48.5cm high which is a real asset for those people with not much space to spare or who want a dehumidifier with as small a foot-print as possible. The DES14 is also light, for a refrigerant dehumidifier, weighing in at 9kg. It also sports a very convenient, top mounted carry handle to make moving it in between rooms a breeze. You can also fit the 4 supplied castors to the base of the unit if you would prefer to wheel it between rooms instead of carrying it. Delonghi have also supplied a very lengthy 2 years manufacturers warranty which shows real confidence in this product. Inside the Delonghi DES14 is a specially made ‘silver-ion’ filter. This is becoming an increasingly common feature in dehumidifiers and is designed to help those people with allergies and to improve the quality of the air in your home. In addition to trapping dust, a silver ion filter is impregnated with small particles of silver which provide an antibacterial action. When irritants such as bacteria, spores or fungus come into contact with the filter they killed. This has the effect of purifying the air and also helps prevent the propagation of mould. Rather unusually Delonghi says that you can wash this silver ion filter. This is contrary to the typical guidelines given – where washing with water can degrade the performance of the filter. What do we recommend? Well, we recommend gently vacuuming the filter to help prolong its life and only washing it if absolutely necessary. If you’re looking for an easy to use dehumidifier then the DES14 should not disappoint. The only control on this unit is a dial on the top of the device which is used to set the humidistat. Turning the dial clockwise switches the machine on and increase the power of the unit, setting the target Relative Humidity (RH) lower as you turn. This kind of configuration is common to most dehumidifiers and unfortunately so is the lack of adequate labeling around the dial. It would be clearer for the target RH to be shown around the dial you can see exactly how you are setting the machine. Instead Delonghi have included only ‘Min’, ‘Med’ ‘Max’ and ‘Dry’. It would be unfair to be too harsh on Delonghi for this because most manufacturers label this way – Ebac are notorious for only sparsely labeling their control panels! However, if you would like a few more options on your control panel you could always check out the impressive DC12. Continuing with the DES14 control panel we would say that the RH you can set on the dial between ‘Min’ and ‘Max’ would probably range from around 60% – 40% respectively (this is an educated guess based on the common RH ranges provided by most manufacturers). Whilst between these settings the unit will operate unit the selected RH has been reached and then go into standby mode. It will then work on maintaining the RH by switching on/off as required. Which is fantastic money saver because the machine is working only when it is needed. The ‘Dry’ setting on the dial is the most powerful and does not have a cut off point. When in this mode the machine will work as hard as possible to lower the RH fast. This makes it ideal for quickly drying any rooms with damp problems and (as most people use it for) to help dry washing on those days where you cannot hang it outside. When the machine is first switched on it will not operate for 3 minutes and sits in standby mode. Why? Well, this is a rather clever feature built-in be Delonghi to help extend the life of the unit. Starting and stopping the machine too often can cause the compressor to wear out (a device common to all dehumidifiers of this type). This mechanism protects this key component. Most dehumidifiers provide you with some feedback to alert you when the tank is full or when the machine is operating, for example. The DES14 provides two indications lights common to virtually every dehumidifier of this kind. The first is the tank control light. Serving a dual purpose this one not only shows you when the tank is full but also if it has been inserted incorrectly. This is particularly useful given this device will not start until a 3 minute pause has elapsed. In which time you may have left the dehumidifier to work, not knowing that it would never start because the tank cannot collect water. The second light indicates when the machine is in standby mode or when the temperature is getting low. When the ambient temperature drops this dehumidifier will help prevent the formation of ice on the cooling coils (the part of the machine where excess water in the air is condensed and collected) by temporarily suspending the dehumidifying action and simply operating the fan. This keeps the machine operational but also makes it less efficient. If you do see this happening we recommend raising the temperature of the room to at least around 10 degrees to keep the performance of this machine effective. Where can you use it? 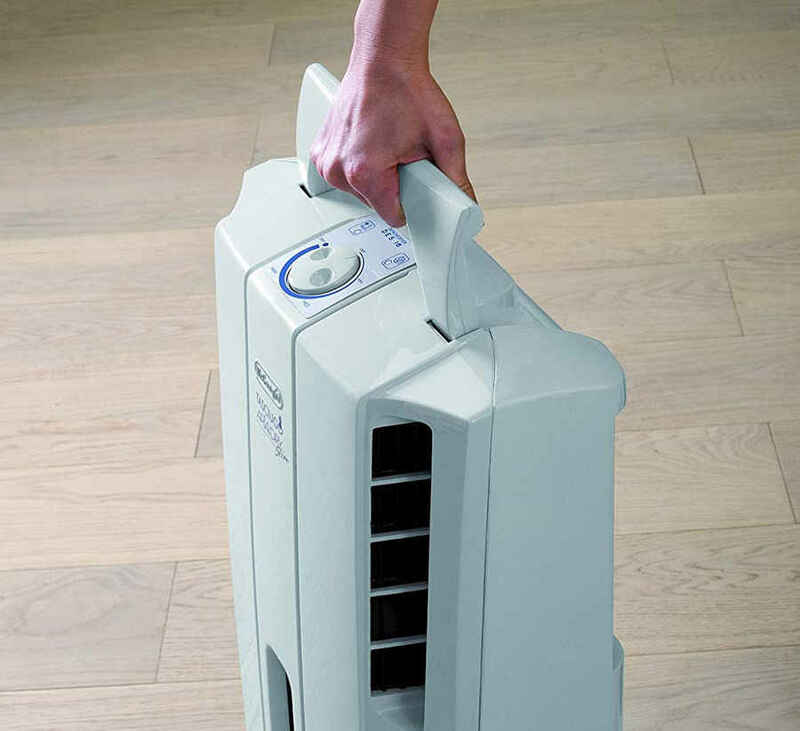 This dehumidifier is powerful enough to be work in rooms up to 65m². Making it suitable for homes up to 2/3 bedrooms at the most. When used across the home it will be able to keep condensation at bay and also prevent the growth of mould. Although it will be most efficient when left to work on a single room and would easily be able to deal with significant damp problems localized in one space. In most homes the ‘Med’ setting should be sufficient to keep condensation at bay on all but the coldest days. If the outside temperature falls below 5°C you may need to turn it up to ‘Max’. Although we would typically recommend this advice for most dehumidifiers. Delonghi quote that this machine can comfortably operate in temperatures ranging between 2°C and 32°C making it suitable for use in the home only and not be used in outbuildings or your garage. The only kind of dehumidifier suitable for use in this environments is a desiccant dehumidifier. So if you need a unit which can work in colder environments you may want to look at the DC202. The Delonghi DES14 performs rather well and collect up to 14 litres of water per day and houses a good-sized 3 litre water collection tank. But, from experience, you will probably find that, on average, you will only need to empty the tank every day or two when you have the damp problem under control and that you won’t collect the 14 litres per day quoted by Delonghi. The reason for this is that operating conditions Delonghi have tested the DES14’s performance in was a very balmy 32°C and 80% RH. This is basically getting on for a tropical climate and not something we experience often in the UK. However, this is nothing to be concerned over and it will still perform well – but is worth knowing. 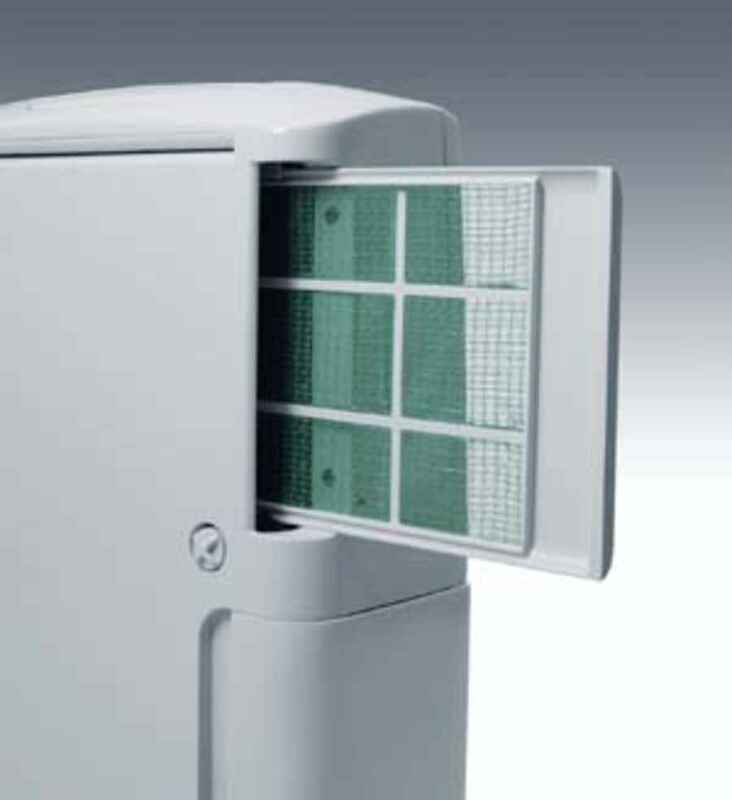 As with most dehumidifiers the DES14 also sports a continuous drainage option. This will allow you to direct the water it collects directly into a sink/drain using a hose and removes the need to empty the tank. This is very handy if you want the DES14 to run uninterrupted. Finally we reach how noisy the DES14 is to use and, for a refrigerant dehumidifier, it is relatively quiet at 40db and should sound very similar to an extractor fan running. This, in part, is due to the fact it only has one fan speed. Which is great for keeping the noise levels low but also has the disadvantage of not allowing you to get a power boost when you need it to tackle damp faster. The DES14 doesn’t come with all the bells and whistles some of the modern dehumidifiers have (such as ionizers and digital controls), but it is still a solid unit which is very easy to use. If you’re after something a little more modern and has a few more features whilst still remaining in a similar price range you might want to look at the EcoAir DD122 MK5. 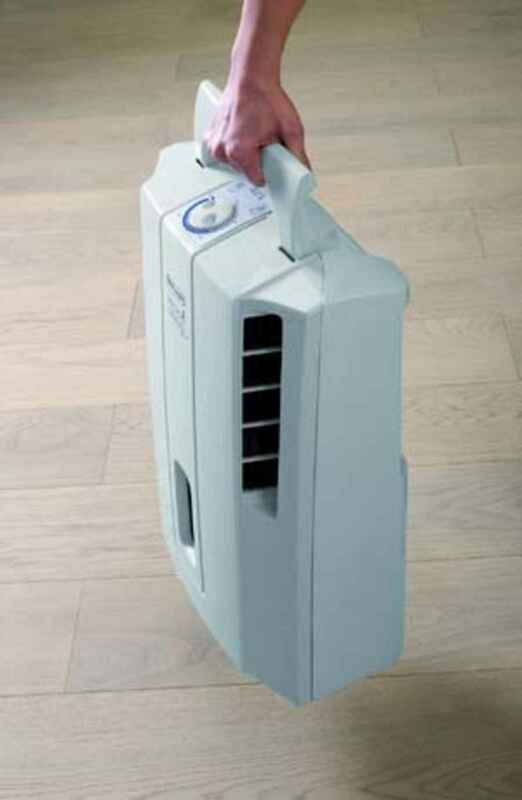 But, if you’re after a simple & effective dehumidifier the DES14 is sure to please. Welcome to DehumidifierReviesHQ! We're' a site dedicated to bringing you the most varied and useful selection of dehumidifiers into one place. Our buyers guides & hands-on reviews have helped thousands of people across the UK find the right dehumidifier for their needs. DehumidifierReviewsHQ.co.uk is a participant in the Amazon EU Associates Programme, an affiliate advertising programme designed to provide a means for sites to earn advertising fees by advertising and linking to Amazon.co.uk. This does not affect the price you pay and allows us to provide this resource free of charge.